Cloudy skies. Low 56F. Winds light and variable..
Inflammation of the conjunctiva is called conjunctivitis, and is a general term that does not specify what exactly is causing the problem. 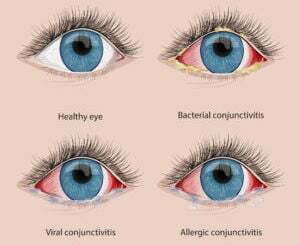 Infectious causes of conjunctivitis can be due to a virus or different types of bacteria, and irritants in the environment cause allergic conjunctivitis. I’ll discuss viral, bacterial and allergic conjunctivitis. Viral conjunctivitis is the most common cause of infectious conjunctivitis, and is highly contagious. It is caused by the same virus that causes the common cold. Symptoms include eye redness, swelling, itching, and a watery or mild mucous discharge. It usually starts in one eye, but since it is so contagious, often infects the other eye in a few days. There is no treatment, and you have to let the virus run its course (much like a cold). Since it is not a bacterial infection, antibiotics do not help! There are drops that your doctor can prescribe that can help with the irritation and itching, but these drops will not help the infection clear more quickly. Cool compresses with a wet washcloth may help with the discomfort, and frequent artificial tears will help ease symptoms as well. It is important to practice good hand hygiene in order to prevent infecting other people with this highly transmittable virus. Wash your hands frequently, especially after touching your eye or face. Don’t share towels or pillowcases, and wash these daily. Even despite good hygiene, family members or people in close contact often still contract the infection. You can be contagious for 10-14 days after the start of symptoms, so people who work in schools or health care facilities should be especially conscious of hand hygiene to prevent infecting others. Symptoms can last anywhere from one to two weeks, and sometimes even longer. Children often contract viral conjunctivitis due to being in such close contact with many other children in school or day care, and are less likely to have good hand hygiene. It is often from children that adults contract the infection. Bacterial conjunctivitis is much less common than viral conjunctivitis, and the source of infection is either by direct contact with an infected person’s eye secretions, or spread of the bacteria that live in your own nose or sinuses. The eye is usually red, painful, and typically has a significant amount of mucous and discharge. Bacterial conjunctivitis commonly only affects one eye, but can involve both eyes as well. This can also be easily spread from person to person, so all the same precautions need to be taken as with viral conjunctivitis. Most bacterial eye infections will resolve on their own without treatment in 2-7 days, but can be treated with topical antibiotic drops or ointment. Allergic conjunctivitis occurs when an irritant or allergen in the air or environment comes into contact with your eyes and causes irritation, and people with asthma or allergic rhinitis are more likely to experience eye allergies. Common allergens include pollen or pet dander, but other things like cigarette smoke or strong chemicals can cause eye irritation as well. Symptoms include intense eye itching, redness, tearing, burning, and eyelid puffiness. Usually both eyes are involved, and this is not contagious. Avoiding the trigger, if possible, is recommended. Make sure to clean carpets and bedding regularly to remove accumulated allergens. Patients who suffer from seasonal allergies can try over-the-counter allergy drops to alleviate the symptoms, and there are also prescription allergy drops that your doctor can prescribe. Cold compresses and artificial tears may help make the eyes feel better as well, and sometimes an oral antihistamine may be recommended. If you’re suffering from “pink eye,” it’s important to know what type of “pink eye” you have, if your problem is contagious, and what treatment options you have. While most conjunctivitis will heal on it’s own, always consult your eye doctor if you have any prolonged or concerning eye symptoms! Sarah Queck, MD, is an ophthalmologist at Lindstrom Eye and Laser Center.